I love love LOVE two things best when cake decorating- a fun cake design and making a cake for someone I know! This cake had both! When Jesseca from One Sweet Appetite asked if I could make a cake for a going away party she was throwing I said of course! When she said she wanted a white trash trailer I about DIED! I was SO excited!!! 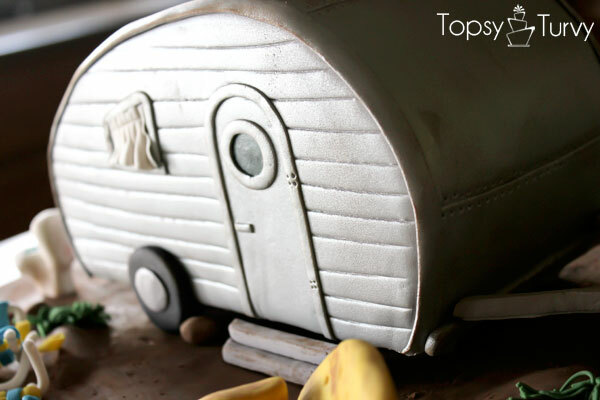 The cake is the trailer… everything else is fondant… but the details MAKE it! 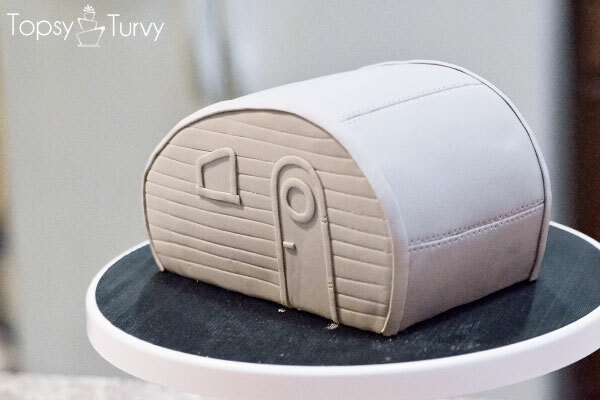 I wish I’d taken a better picture of underneath the trailer… I made little fondant cinder blocks to cover the dowels holding the cake up! I’m SO in love with it all! I took two layers of 8 inch chocolate cake and “glued” them together with chocolate Ganache. Then placed it on the side and started carving! Jesseca choose the tear drop shape (or canned ham) trailer! Then covered it with whipped Ganache. 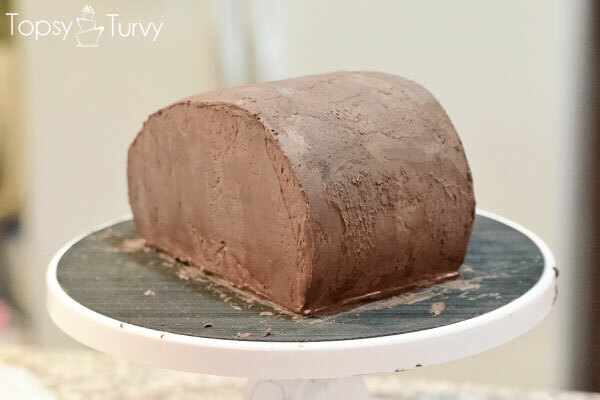 I covered it with grey fondant and used a pizza cutter to create lines on the sides of the cake. then “glued” on the details with vodka (or clear vanilla if you’d rather). This is when it got late and I forgot to take more pictures- (although I instagramed a few…) dang it… but I sprayed it silver and hand created all the rest of the details out of fondant. 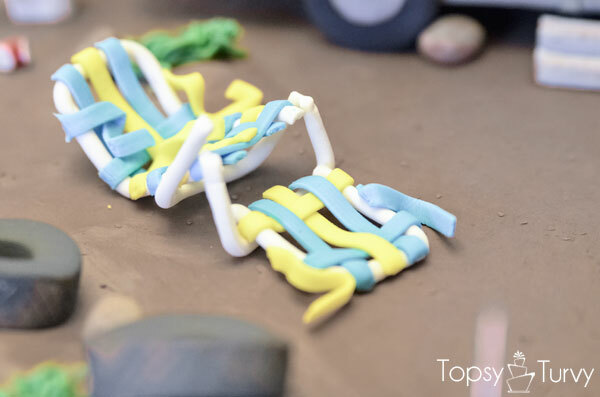 My favorite pieces is probably this broken folding chair! Actually my broken version broke, so it’s TWICE broken, how white trash is THAT! 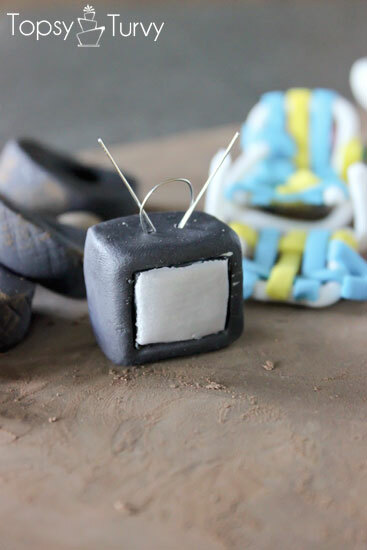 I made a TV for our trailer dwellers… I wanted to BREAK it, but I couldn’t figure how the best way to do that, so I added aged rabbit ears instead. The TOILET… one of the few requests Jesseca gave me, that and the random beer cans around. I made 4 different toilets trying to get it JUST right. I’m dying I’m so in love with how it turned out! 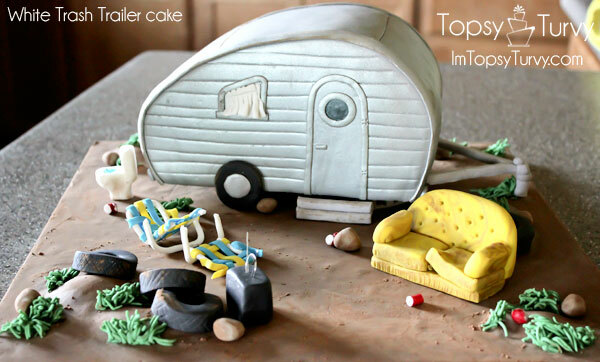 I love my trailer cake and I hope you all do to! 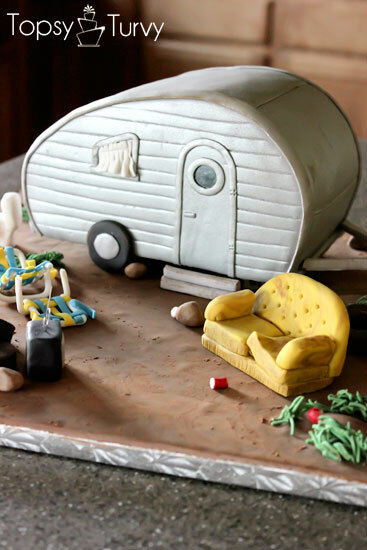 wonderful trailer cake!i cant imagine it s a cake..how can she feel to cut it?ashlee you have nimble fingers ..appreciate you.. Thank you so much! She did say it was hard to cut into! This is AWESOME!!!!!! What a fun cake!!!! Thanks so much! It was SUPER fun to design and make! It was SO perfect!! Everyone loved it, and it was really really hard to actually cut and eat it. I’ll have to find out what chocolate cake recipe you use. It’s SO yummy! It was SUCH a fun order to make! And fun to make something for a friend! I’ll email you the cake recipe! Thanks for sharing your red velvet with me! I love it! Your cakes are so fun! Thanks Jess!!! I really really love creating them! It’s so much fun to carve and design such fun creations! This is hilarious, and so freaking awesome! Thanks Kara! It’s been a long time since we’ve seen each other! I miss you! We need to get together soon! I loved this so much I had to pin it! Thanks so much! I’m glad you like it! I wish I was going to make it to the party tonight so we could officially meet in person! I my goodness! I totally love it! You are so talented. Thank you so much! 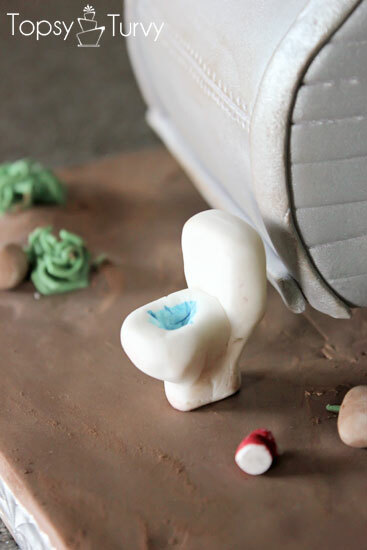 When the subject of the cake is so much fun it’s easy to get creative and really get into the details! Oh my gosh this cake is seriously awesome. Great job!!! Seriously how fun is that! I agree, SO fun! 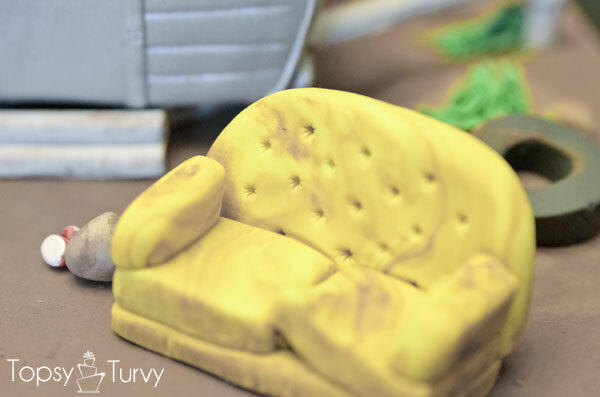 It makes such a difference in a cake to have a subject that’s so enjoyable! You are so talented! Love this cake!!!! Thanks Michelle! It’s been too long since we’ve seen each other! Glad that work is going so well for you! WOW! This is awesome! Maybe I missed it- how long did this take you? I know when I did my little boys cake, Lightning McQueen- it seemed to take forever! But then again, that was my first cake I had ever decorated by myself… Great job! If you ever need a cake let me know 😉 It turned out pretty darn cute! Girl friend you ROCK!! This is amazing and makes me giggle every time I come back to visit it!! Thank you so much! And thanks for the shout out on FB! If you ever need a fun cake for work or anything let me know! I’ve done a few pinterest inspired smash cakes if you want one for your show! This is so cute! Honey Boo-Boo would love it. Thank you so much! my mom died, she and my dad are living in a trailer right now and she now wants me to make one for her! That is a amazingly cool cake. You are great at making cake. thank you so much! 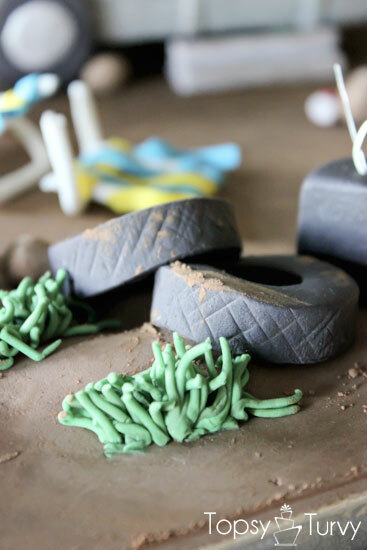 Having such a fun subject to make a cake on makes it that much more fun to design! I love creating and doing it! Love this!!! We drive by a little trailer community once in a while, and this is about how it looks with about 10 more trailers scattered in random spots. 🙂 and probably a few more broken things layin around. This made me laugh!!! You are really really creative!!! It really was! one of the most fun of all the cakes I’ve done!